Continental just makes a better cylinder ...I have no vested interest in Continental and I don't sell their cylinders but I do appreciate good engineering and design...attention to details that I don't see in other "PMA" cylinders. Notice the stud isn't even straight and the design puts the maximum stress at the surface where it is pulling metal already. 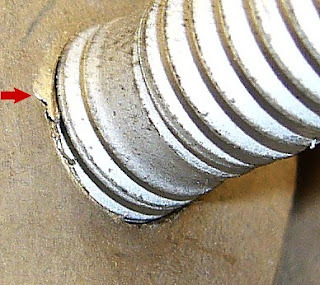 Now look at the same stud on a Continental cylinder. Chamfered hole. Notice how the first engaged thread occurs below the surface. Stud is "waisted" - that is a good thing!. 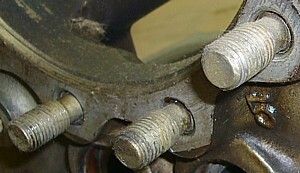 Waisting is the reduced diameter in the unthreaded portion of the stud. 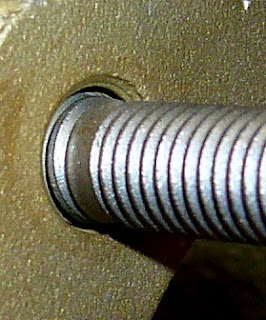 This diameter is now the same as the root diameter of the thread making the stress evenly distributed throughout the stud. Here is a picture of a waisted cylinder hold-down stud on a Continental. 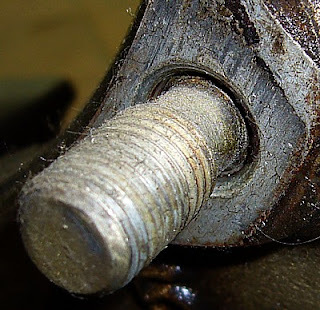 The reduced shank diameter also allows the stud to store more energy as it will stretch more than a non-wasted stud for the same amount of applied tightening torque. This increases fatigue strength and helps prevent joint loosening.